Send e-mail with contact form. If you interested in our parcel post fees. Please, jump on the end of this page. Bank Fees: jump on the bank fees. So far as you like some of our products, you see them on the monitor but you would like to take on your hands and see. Please, contact with us we can send sample free of charge most of our product (molding, crown molding ogee, rattan, material for door panel). We send the samples without postage fee to the European country, but outside of Europe we ask the postage fee. Please, also contact us if you need more photos, detailed descriptions. If you would like to buy our products, we receive order by e-mail or fax. In the case of the customized, tailor-made products (for example mission trellis from wood) we ask 30 % as payment in advance to start the fabrication. After the wire, please, indicate us that you send the wire. This information need for us to receive and identify your wire. Account holder: Naturtrend Impex Kft. We accept payment by Paypal, also. Paying by credit card is possible through PayPal bank, it does’nt need to have a PayPal account at all. 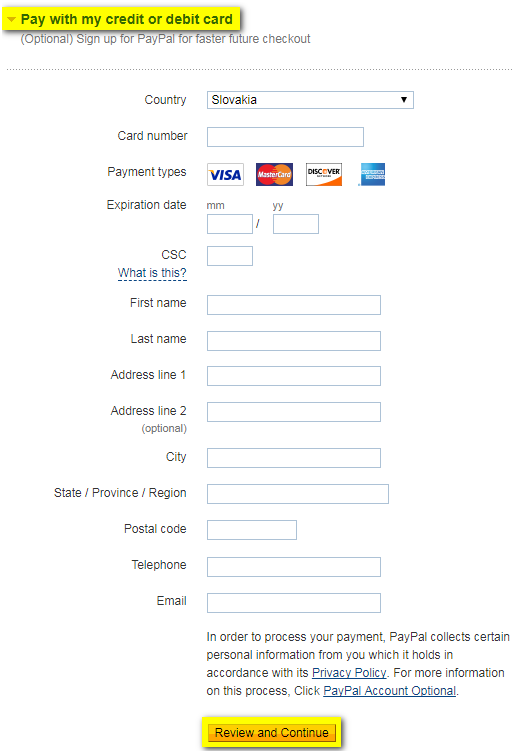 We will send a money request to you if you ask for credit card payment. Click on "Pay Now" button on the bottom of the mail. On the appearing page please check the amount of the money and press "Continue". Fill out the details on the next page then click on "Review and Continue". We send the ordered product by parcel post on the charge of customer. The fee of breakage resisting packing is 1 €. We could not be responsible for damages arose from the carriage. If you a firm in the European Union and you have valid EU Community VAT identification number. and certify it for us: you must make a copy or scan the paper of your EU Community VAT number and send a declaration you have right to buy without VAT. We can merchandise on net price (83,33%) for you. This is our GDPR information. When you buy of our products, you give your datas for our company, called Naturtrend Impex Kft. (Data controller), than we became controllers of your datas. Personal data is any information that relates to an identified or identifiable living individual. The data arrives in two ways. The cookie saves some datas technical automaticly. During the purchase you must to give us some datas for the contact. The purpose of the GDPR is to discharge our obligations referring to the orders, and provisions of informations about our society. The privacy of your data and the conformance to the GDPR, regulated in Regulation (EU) 2016/679 of the European Parliament is very important for us. We process the personal data as long as it is necessary. We make effort to save the security maximum of the data processing. We preserve the right of change our information notice. Our website can contain some links who lead to the websites of other societies. We are not taking responsibility for theirs Privacy. Types and the processing area of the personal data? We don’t do profiling of datas. (Profiling means the procedure which may involve a series of statistical deductions, often used to make predictions about people). We save the phone numbers just for the contract, we don’t do any lists. We use the datas of our clients just based on legislations. We don’t give them to third parties. We obtain datas just from the person concerned. If the client give for us datas of contact persons, he’s the responsible of accuracy and legality of the datas gived. If you notice than your datas doesn’t processed legally, inform us without delay, and we will delete it soon as possible. The Data Controller can collect informations about the number of visitors, or of the frequency of visiting. These datas serves other statistical purposes. The collection of datas collectifs can help us to estimate the interest and need of our clients. we store invoices on way electronic and in paper too. we store orders, contracts and mails related on way electronic and in paper too. We store datas online just on the server situated in EU. Datas paper-based are closed. After period of storing they will be destroy. Datas digitals will be deleted after period of storing too. Analytics cookies that anonymously remember your computer or mobile device when you visit our website. They keep track of browsing patterns and help us to build up a profile of how our readers use the website. We use that information for customer analytics and to serve advertisements that we think might be of particular interest to you on our and other websites. Your browser may use similar cookies for similar purposes and to serve advertisements for others. Cookies help us to make our website work. Datas coming from cookies are used for 6 month. You can delete the cookies from your computer. This page will helps you on it. The cookies of Google can be delete on the following link. Naturtrend Impex has a Facebook site. The data provision on Facebook is volontary. That’s you, who can give datas, and delete the datas gived. You can see the Facebook’s Privacy here. 2351 Alsónémedi GLS Európaút 2. 1031 Budapest Záhony u. 7. We never give personal datas for marketing purpose. We process your datas confidantially. We have a Privacy, and our employees know it well. They must to respect it. We close the datas safely. The Data Controller assures authenticity, accessibility, integrity and confidence of datas processed. The Data Controller controls the rules regulary, and changes it if it’s neccessary. We store datas online on the server situated in EU. We inform you, than in spite of the precautions the datas on Internet can’t be to save from all attacks. In case of attack, please inform us. We will notify it to the Supervisory Authority in 72 hours. We keep a record of these attacks. It’s a free service once a year. You can ask for correction of your datas. The cancelling of datas is possible after the period of processing. We inform of the correction and the deleting of data the person related and the previous recepients of process of data. We inform you, than you can’t protest of our legal data process. As we don’t send newsletters, we can’t process direkt marketing datas. The clients can ask for the limitation of datas if he isn’t sur in the legality of data process. We judge it in 10 days. If a disagreement the client should go to court in 30 days. In case of legality problems the client can go to the National Data Protection Authority. In case of juridical process the competent court is the Hungarian Court.